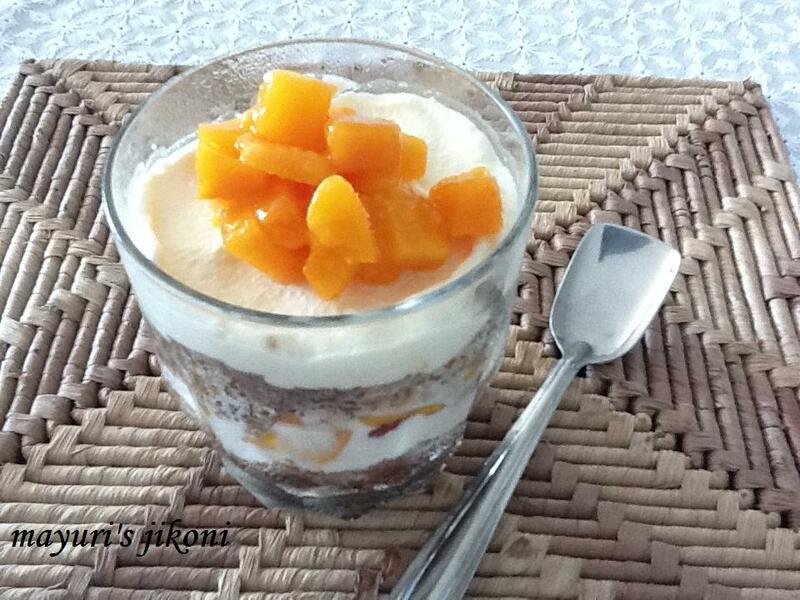 I prefer making easy desserts and ones which are cold, mainly because of the hot weather in Mombasa. This dessert recipe was given to me by my sister in law Arti K and its been my all time favourite. I make it quite often when I have guests over and they all think that the brown layer is made of cake. But it isn’t. Over the years I have made changes to the original recipe by adding more chocolate, less cream, a variety of fruits etc. The original recipe required stale brown bread, but I use fresh as the stale brown bread makes the layers a bit too dry. It is a bit difficult making this trifle in India if you don’t get fresh cream as the Amul cream does not become fluffy on whipping it. Try and get some fresh cream which sometimes is available in the bigger stores. Take about 8 to 9 slices of brown bread. Process it in the food processor to get crumbs. Add the sugar, vanilla extract,nuts and drinking chocolate to the bread crumbs and mix well. Divide the mixture into half. Chop fresh fruit of your choice. You can use any single fruit of mixed fruit. Whip the fresh cream with powdered sugar till it forms soft peaks.Divide the whipped cream into half. Take 8 glasses or bowls. Add to each container some bread mixture. Press it down gently with a spoon. Top each bread layer with the chopped fruit. Top the fruit with half of the whipped cream. Add the remaining bread mixture on top of the cream. Top with the remaining cream. Leave in the fridge for the cream to set for nearly 4 to 6 hours. Just before serving top it with your choice of topping. Choice of toppings can be fresh fruit, nuts, grated chocolate. Use nuts like pistas, walnuts, cashews, almonds. Can make more layers if you like. Use fruits like mangoes, strawberries, tinned pineapple, peaches, etc.